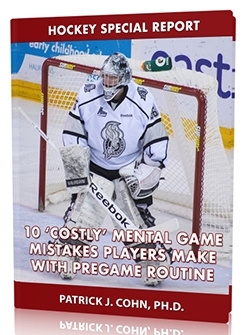 Do you have bouts of negative thinking or doubt your skills during hockey games? 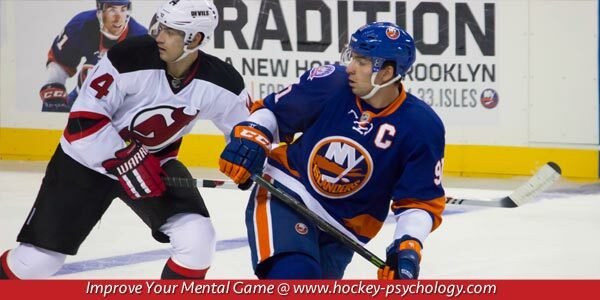 Do you allow your negative thoughts to negatively affect your play on the ice? The term “mental toughness” is often misinterpreted in the world of sports. Mental toughness is not the absence of negative thoughts nor does it imply that you are mentally weak if you have self-doubt during a game. Those types of thoughts are natural reactions to mistakes and everyone has those types of thoughts. Trying to repress or “bottle up” negative self-talk can increase its intensity. Mental toughness is not denying the existence of negative thoughts or emotions. Mental toughness is managing your thoughts/emotions, then re-focusing on what you need to do next. Blackhawk goalie Corey Crawford slammed his stick in frustration as he left the ice. Crawford gave up two more goals in the second period and the Blackhawks were trailing the Kings heading into the third period 4-3. Does Crawford’s act of frustration call into question his mental toughness? Remember, everyone experiences negative thoughts and emotions during competitions. It’s a part of the game. But can you turn it around? And Crawford responded in a mentally tough fashion making critical 19 saves in the third period and overtime to help the Blackhawks win 5-4 in double overtime. Blawkhawk coach Joel Quenneville recognized Crawford’s mental toughness and ability to manage his emotions. Crawford stated the important thing in hockey is moving past mistakes. Tip #1: Let go quickly of a mistake and the emotions. Figure out what you need to focus on the next play. Tip #2: Never get down or give up. Athletes who have ready-made excuses will give up easier when losing the game. Instead, focus on the reasons to make a come back and stay patient.